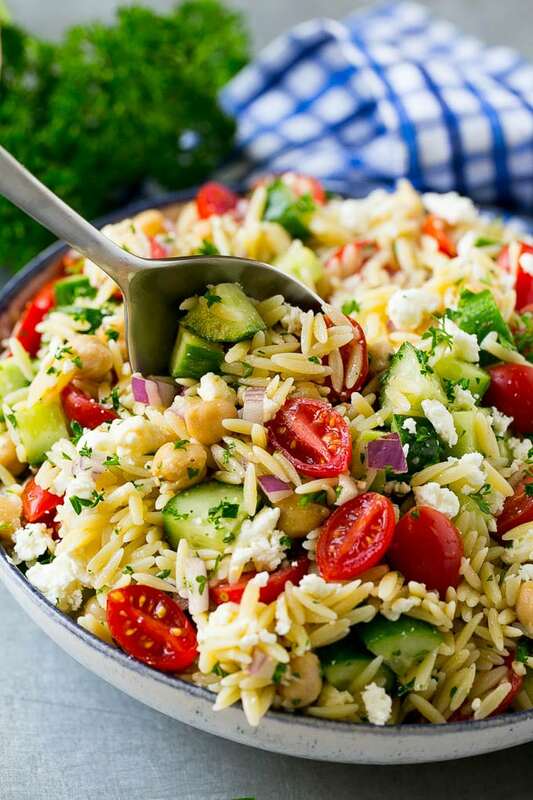 This Greek orzo salad is made with cucumbers, chickpeas, tomatoes, red onion, feta and herbs, all tossed in a herb dressing. A simple yet hearty pasta salad that can be served as a main course or side dish. 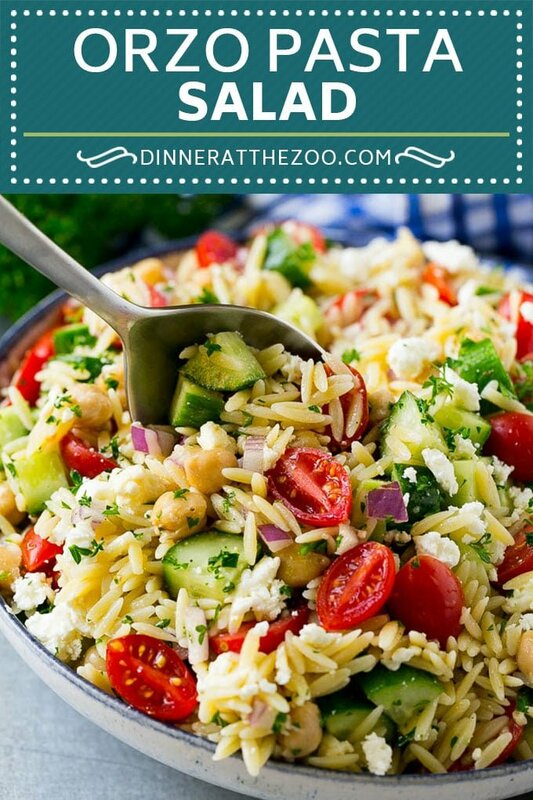 Orzo pasta salad is an unexpected and delicious addition to any meal. 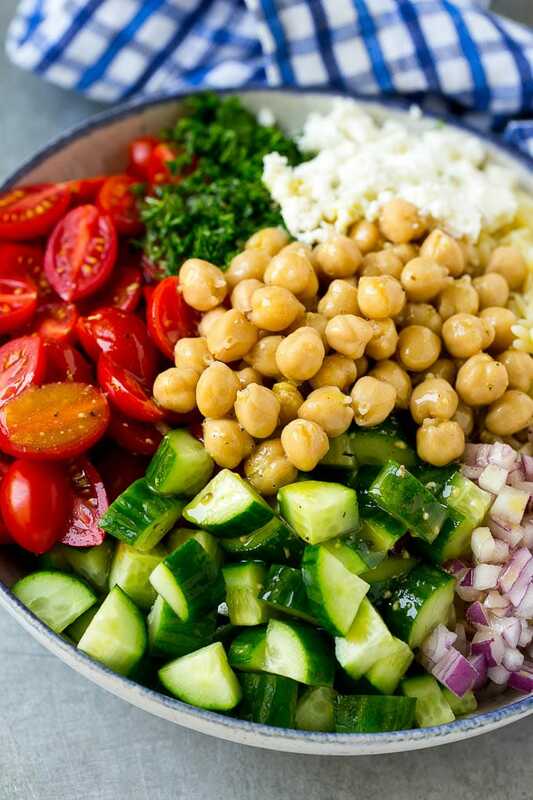 The combination of crunchy vegetables, protein packed chickpeas and creamy feta cheese just can’t be beat! There’s nothing better than the perfect side dish when it comes to a summer get together. I enjoy coming up with various side dishes that are fresh and new like this orzo salad. 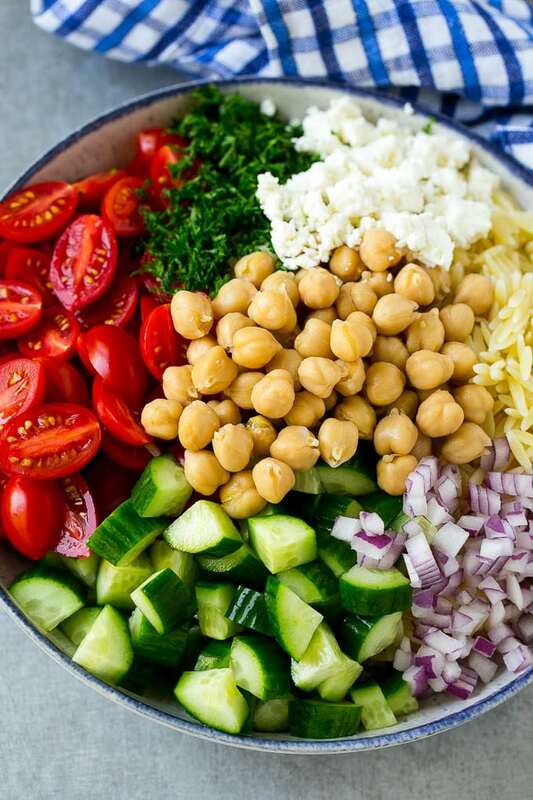 The delicious mixture of chickpeas and crunchy vegetables pair well with the creamy feta cheese to make the ultimate easy summer salad. HOW DO YOU MAKE ORZO SALAD? This orzo pasta salad is made with fresh veggies and herbs to provide the best flavor. 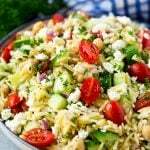 A combination of tomatoes, red onion, cucumbers, chickpeas and feta cheese is mixed with orzo pasta, then tossed in a Greek style dressing. This salad can be made up to 4 hours before you plan to serve it. 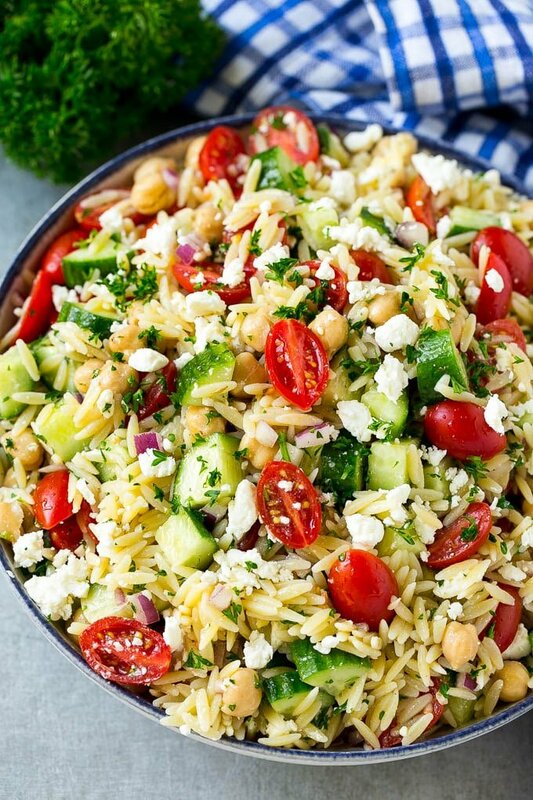 To cool your orzo quickly for this salad, run it under cold water in a colander. The cold water will cool the pasta as well as prevent it from clumping together. The dressing is a simple combination of olive oil, Dijon mustard, lemon juice, red wine vinegar, herbs and spices. It takes about 2 minutes to put together and adds plenty of flavor to the salad. If you prefer to use a different cheese other than feta for your orzo pasta salad, goat cheese is a great substitute. You also don’t have to stick to the vegetables I used. There are plenty of other veggies that would work well either as a substitute or as an addition. Orzo is a type of short cut pasta that resembles grains of rice, only a tad bit bigger. It can also go by the name “risoni.”You can find orzo in the pasta aisle of almost all major grocery stores. HOW DO I USE ORZO? Orzo is cooked just as most pasta is – boiled. You can use orzo like you would rice or in a variety of pasta dishes. This orzo pasta salad is so easy to make that I make a batch a few times a month, I love to have it as a lighter lunch. It’s definitely healthier than many other side dishes can be, and it gets the kids to eat their vegetables. It’s definitely one of my go-to dishes for summer family meals or get togethers. 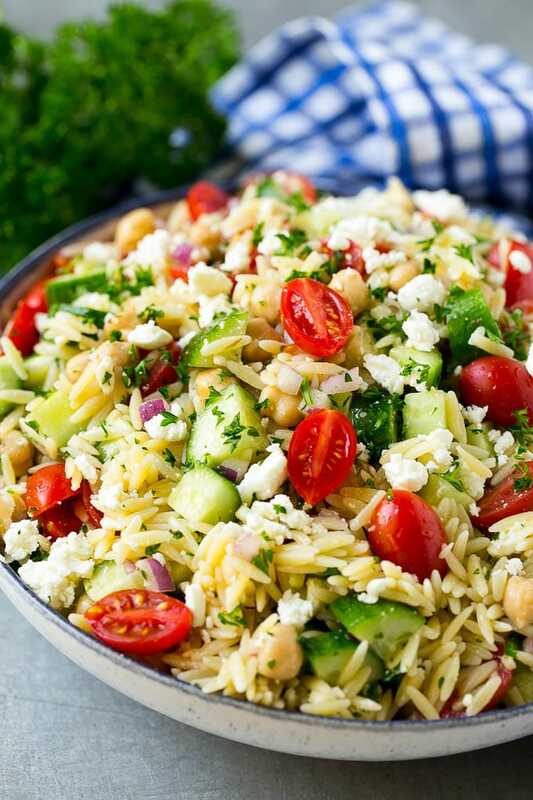 Place the orzo pasta, cucumber, cherry tomatoes, chickpeas, red onion, parsley and feta cheese in a large bowl. In a small bowl, whisk together the olive oil, lemon juice, red wine vinegar, Dijon mustard, garlic powder, oregano and salt and pepper. Pour the dressing over the pasta mixture. Toss to coat, then serve. What a lovely & brilliant recipe idea! Really great.Can’t wait to try this out. Thanks a lot. Keep going. I have just finished making the salad. Next step is to add the dressing before I serve it. Can’t wait to taste this salad. OMG this salad looks beyond amazing! The perfect side dish to any dinner or perfect lunch! This looks so good and flavorful! A perfect healthy salad for the whole family! Meal in a bowl so nice for the hot weather we are having. I think it would be tasty for more than 1 day. This is a very impressive post. Nice ideas and shots. Such awesome and fresh ingredients. I would love to try this salad. Yummy! I’ve never had this before, but oh my goodness does it look amazing. Bookmarked for the next time I make lasagna. Yummy! This looks absolutely yummy and a perfect summertime dish. Thanks for sharing this delicious recipe.